Ryan, with a smile you can see right through his facemask, skating at Citizens Bank Park. Ryan smiled through the entire experience. I could see his smile right through his facemask in pictures I took from 100 feet away. My wife and I fought back tears. My parents sat through bitter cold and wind for four hours to watch him play for a few minutes each intermission. I think even his sister Riley was proud. That’s what I love most about Ryan’s participation in hockey. The moments when I can see his smile right through his facemask. Even two-plus years later, he still celebrates every goal in every drill as if he’d just clinched Game 7 of the Cup Final. Ryan, with a smile you can see right through his facemask, skates with me on Father’s Day, 2010. When the drills began, the coaches called out Ryan to lead some of them for the group. When the coach told him to “bring his dad,” Ryan broke out in an ear-to-ear grin that was easily visible through his face mask. And drill we did: Superman rolls (I think I tore all my abdominal muscles on that one), wagon pulls, broken-wheel wagon pulls, passing, shooting. I knew I had used the phrase before, but until I searched for it, I didn’t realize how often I’d used it. Several of our happiest moments, all described on this blog, all using the same language — a smile you can see right through Ryan’s facemask. 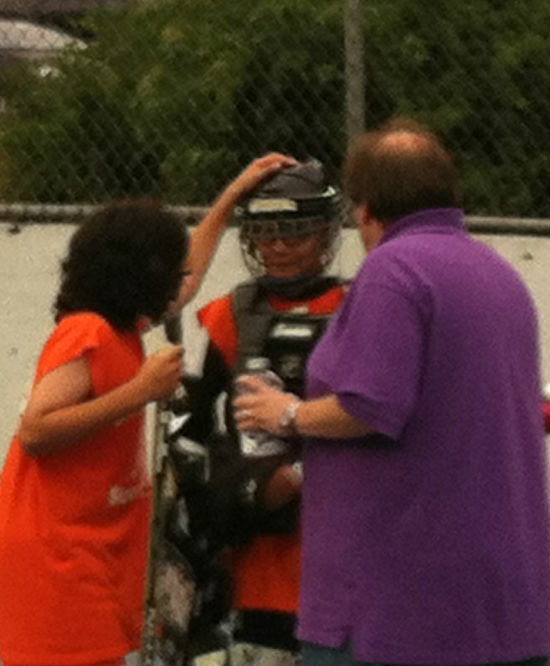 Thursday marked Ryan’s big début in goal for his street-hockey team. With the regular goalie out, he volunteered to fill in. We enthusiastically backed him. The coach put him through extra practice on Sunday to prepare. Finally, it was game time. Veronica was nervous. She didn’t sleep much Wednesday night, worried that Ryan was going to play poorly and cost his team the game and its undefeated record. I was calmer. Maybe it was all the hours playing street hockey in the backyard with Ryan and observing his improved skills. Either way, at puck drop, our fears or confidence no longer mattered. It was up to Ryan now. I tried to block out any negative thoughts as I watched him warm up. I really believed he was going to be fine, and I didn’t want to think about the fallout from the alternative. Would he handle it? Would there be a meltdown? Tears? Backed by an excellent team defensive performance, Ryan allowed only one goal in a 4-1 win. He made several difficult saves. He came within a few minutes of a shutout before allowing a goal on a bad bounce in the third period. He was mobbed by his coach and teammates and cheered by the assembled parents when the game ended. 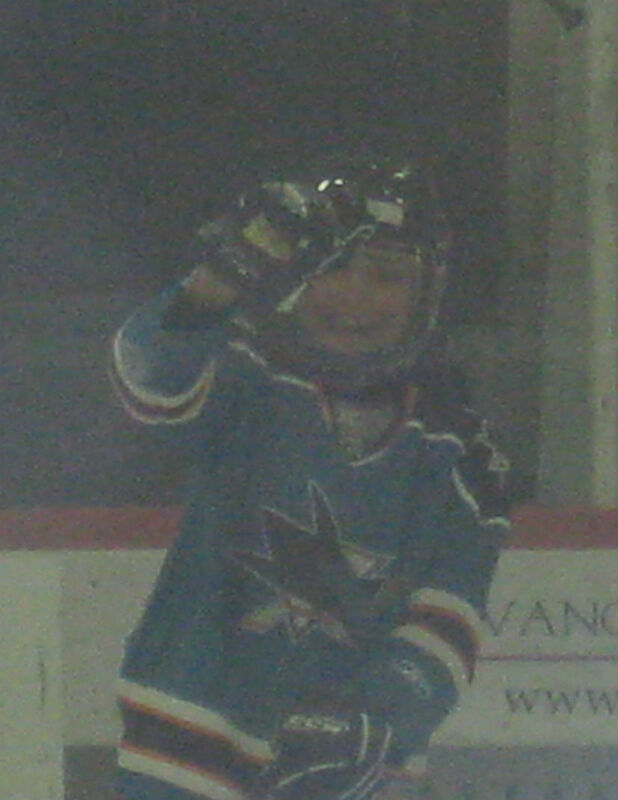 He ran to the boards to celebrate with Veronica, beaming from ear-to-ear. Recounting it later, she just kept remembering his smile. “I could see it right through his mask,” she told me, jogging my memory about that phrase. Look closely — there’s a smile you can see right through his facemask. It was wonderful to watch Ryan revel in his success. To hear him boast of his ability. To listen to him award the game’s three-star selections in the car ride home, and name himself the No. 1 star. I loved every second of it. Seeing my child express such joy at his accomplishments is more than fair payback for the times I’ve seen him humbled by life. There’s no particular look or expression that characterizes those low moments. But every time I am rewarded with a smile so big that I can see it right through his facemask, I am carried instantly to the memories of the single happiest moments of Ryan’s life. His first-ever goal. His first goal in a “real” game. Skating together on Father’s Day. 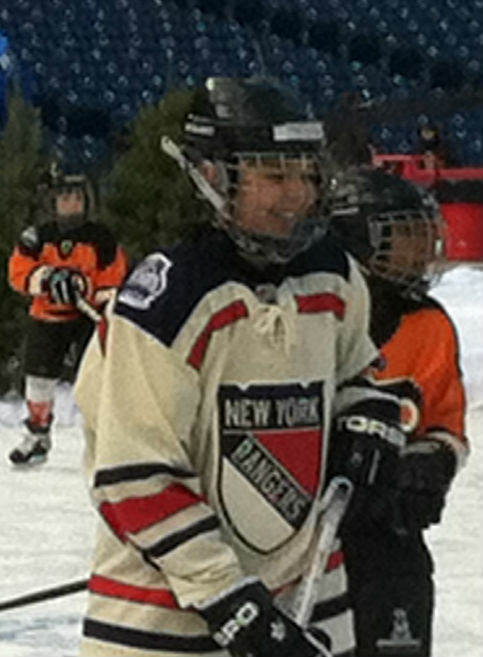 Skating at the 2012 NHL Winter Classic. Being named the most-improved player in his house league. To those I will add Ryan playing goal in a Thursday night street-hockey rec league. 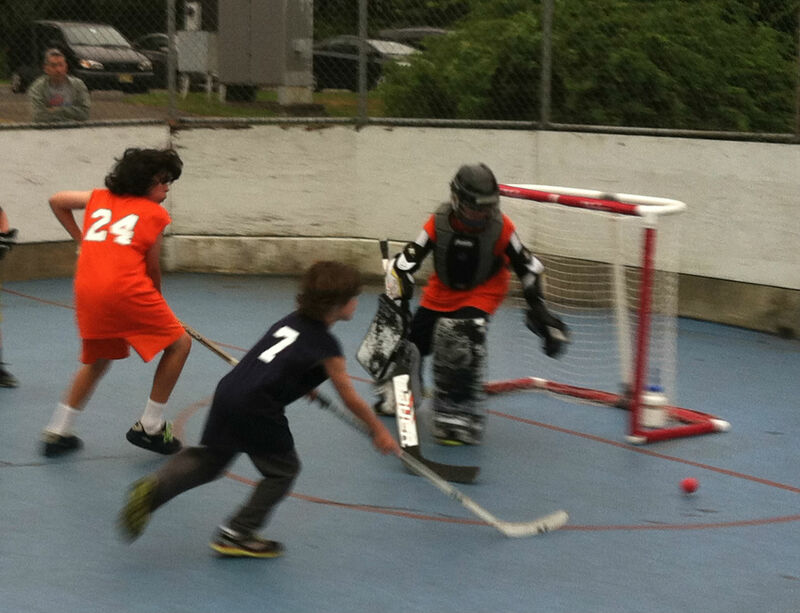 Ryan battles to make a save during his street-hockey début in goal. These are memories that will never leave me. That they all surround hockey, a sport that has been providing me with gifts since I saw my first game at age 4, is no accident. Of that, I am sure. I had total faith in his ability! But I did cross my fingers, say a prayer and send positive thoughts that way! I had a good feeling from all the hours in the backyard that he would be OK. Never been so happy to be right! What a great story! I think people with autism can do a lot more than people give them credit for.